Tsitiskamma National Park and Storms River Mouth, less than an hour’s drive from us in Plettenberg Bay, must be one of the most beautiful places in the world: ocean, mountains, indigenous forest, Fynbos and blue sky. 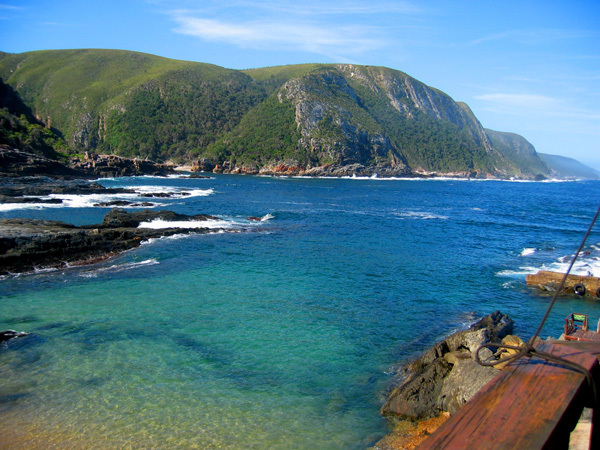 The jewel in Tsitsikamma’s crown, for us, would have to be the Storms River Mouth. A beautiful stretch of coastline, with towering cliffs and accessible where the gorge feeds into the ocean – the mouth. A place where thundering waves crash into a rocky shoreline that merges with a wall of indigenous forest. The river mouth is often calm and clear – ideal for snorkelling, swimming and scuba diving – but, as its name suggests is prone to some stormy and dramatic days. If you’d prefer to stay above the water, Untouched Adventures offers an unforgettable kayak and lilo adventure up into the magnificent gorge, where you’ll paddle amongst the ancient cliffs and waterways. Take a look at the video below if this seems like something you might enjoy, highly recommended! Dolphins and whales: Common Dolphins, Bottlenose Dolphins, Southern Right and Humpback whales are most common. African Black Oystercaster: Several pairs of South Africa’s most threatened bird species nest along the park’s coastline. Knysna Turraco: Turraco, for the beautiful scarlet colour of its wings, this shy bird is also known as the Knysna Loerie. 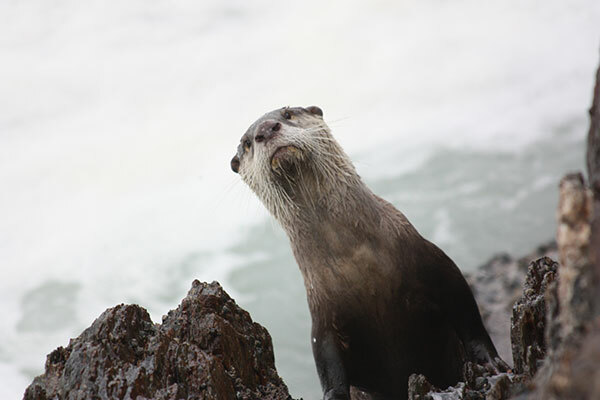 Cape Clawless Otter: You’ll be very lucky to spot one of these adorable and elusive animals, although they do hunt crabs along the coastline, often in the early morning. Blue Duiker: You may encounter this miniature antelope along a forest trail. If you’re pressed for time, then take the Lourie Trail, relatively easy and passing through both Fynbos and coastal forest, emerging onto a plateau at the awesome Agulhas lookout point. Take a breath and head into the heart of the forest where the true giants of the Tsitsikamma forest, the Outeniqua Yellowwood, will leave you speechless. The trail ends where the famous Otter Trail begins. 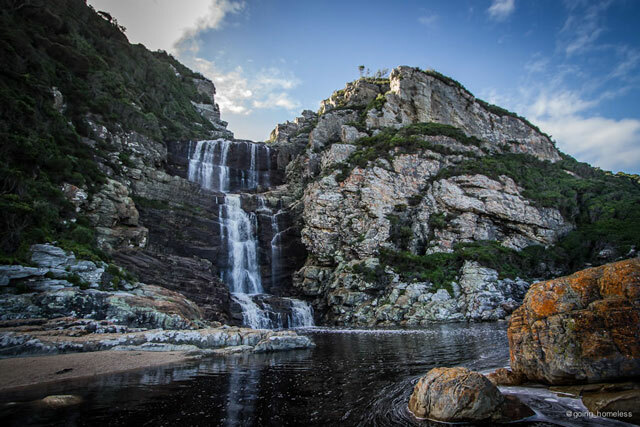 Find out if you have what it takes to do the famous Otter Trail, by hiking the first 3km of rugged coastline to the magnificent waterfall, which plunges into a deep pool, before flowing on to the sea. If you’re planning on hiking the Waterfall Trail, we suggest that you give yourself plenty of time, it’s fairly strenuous and caution is recommended at high tide, but well worth the effort! There is a restaurant and curio shop at the river mouth, so you can buy water and snacks, or relax and enjoy the views.